This is a Rights holding DVD created & produced by me and is not factory made or sealed. I strive to produce the best DVD's possible from the sometimes VERY old Public Domain material. Films that are public domain are un preserved and not professionally re-mastered. I re-master all of my films myself to the best possible quality achievable. My DVDs are not the quality of todays Modern DVDs or Bluray discs. If you are looking for this kind of quality then these discs are not for you. All pictures are actual screen captures from the DVDs. Please note this when purchasing, but also know that all of the films are very watchable. To keep my prices as low as possible all my DVDs are delivered in plain paper DVD sleeves and the DVDs title will be labeled on the back of the DVD envelope. This way you can write the contents of the DVD on the DVD yourself if you want to. (See picture). All of my DVD's come with a menu for easy film selection. Total runtime of the DVD is 155 minutes. This is a fun, innocent movie that doesn't take itself too seriously. Part 60s time capsule (Santa smoking a pipe! ), part legit children's movie, this is one of those movies that everybody needs to see at least once. There's cheesy acting and lines and ridiculous special effects for adults to laugh at, and a fun story for the kids to enjoy. And the martians look a lot like The Great Gazoo, the alien that hung out with Fred and Barney. 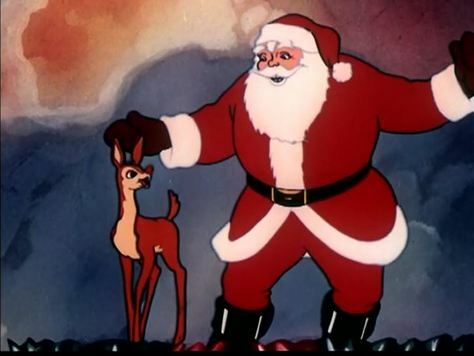 Jam Handy's lesser known cartoon short is kind of a silly adaptation of the classic character, and Santa Claus seems to be the only human left on earth, but it's all just innocent Christmas time fun. This has everything you expect from Jack Benny. He's his unusual cheap self. Mel Blanc is manic in his role of a store clerk frustrated with constant charges in the order. And Eddie Anderson has a great sketch describing what "type" Mr. Benny is. Santa Claus rides in a parade and walks kids through a relentless department-store Christmas display. Filmed in Pittsburgh. Sure to become a cult classic, A Visit To Santa is a very disturbing children's film! A Visit To Santa is indeed a strange and sinister film, and the nonexistent budget is least of its problems. Santa looks like a grubby, alcoholic derelict plucked from a five-and-dime store Christmas display. The narrator sounds like Mister Rogers - if Mister Rogers had been a suicidal depressive pining for the happy childhood he never had. The set is an unbelievably tacky 1950's ranch. The soundtrack of ineptly improvised organ music played on a cheap and terrible sounding organ. The best parts of the movie are the insertions of Christmas parade stock footage and the toy store scenes, which feature some evil looking dolls. All criticisms aside, This film deserves a five-star rating for its sheer mind-blowing creepiness and sinister tone. I can't see any child wanting to visit Santa after watching this film. In fact, it would probably inspire kids to run away from Santa, screaming in terror. Cute little movie about a wee pine tree all upset that there are larger trees then him. He's all mopey until kids spot him and cut him down! Why? To make him a Christmas tree of course! Hurray! All is well! Until of course, they dump him in the garbage after Christmas! A fairy Snow Queen (who's value system is all based on the potential "fun" in any act) brings some toys to life as rather petty revenge on Santa for forgetting to give her her sugar cookie. Minor complications ensue. If you like the strange, retro and somehow just wrong aspects of the Christmas season, this is for you in a big way. Don't miss it. Enjoy watching various animated animals participate in winter sports before breaking into song and following the bouncing ball to "Jingle Bells". I claim ownership and rights to this media. All the films on this DVD have been researched and are copyright free or the copyrights have expired due to non renewal.